It’s hard to believe no one thought of this until now: an adapter that changes the orientation of an electrical outlet, so power cords run parallel to the wall instead of sticking straight out. This way you need less clearance behind furniture and appliances. Plus, it’s a safer alternative to bent plugs and crimped cords that get jammed into tight spaces. Inventor Bob Green figured somebody, somewhere must have come up with a device to solve the problem of cramped plugs and hard-to-reach outlets. His patent attorney thought so, too. But after searching high and low for an existing solution, Bob found none. So he designed and patented his own creation, called Hug-A-Plug. 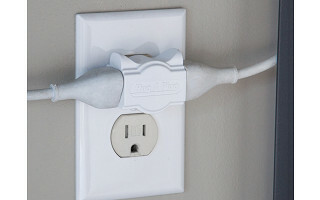 “It lets you use two three-prong plugs in a wall outlet where you want to push a piece of furniture as close to the wall as possible,” says Mary Roback, who wrote to tell us about Hug-A-Plug, which is manufactured in Decatur, Indiana. “No more cords smushed against a dresser or couch. It's great!” With Hug-A-Plug you can save your energy for something more rewarding than dragging furniture away from a wall to reach an outlet. Hi, I am Bob Green inventor of Hug-A-Plug. I had just retired when I came up with the idea for Hug-A-Plug and thought, “This will be great, it will give me something to do when I am not golfing." Wow was I wrong. I work longer now than when I had a job that paid real money and golf – my handicap has gone up 4 strokes. But despite the long hours and problems starting a new business, I have never had so much fun and look forward to answering your questions about the world’s best adapter plug. Bob - I bet you hear "Why didn't I think of that" about 10 times a day! This is one of those products I don't even have to think twice about. I know exactly which outlets need this solution. Thanks for bringing this to market! This type of plug has existed for eon's. Why do they act like it is something new?? I have plug adapters I have had in my house for years that I can plug into the side with. @Todd Dietz: Todd, you are right, there are many adapter plugs on the market. The thing unique about Hug-A-Plug is it requires one inch of space to connect cords. No other UL listed plug takes less space. Additionaly the plug's attractive design lets you use it in visible outlets where apperance is important, like countertops. 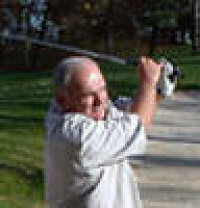 @Bob Green If Leviton licensed your patent, you'd have more golf less work. Hmmm, but are the ones you have had for years designed for grounded outlets? I have only seen klunky surge suppressor type adapters for 3-prong use. These have a nice look. How are they "Hug-a-Plug"? They still stick out an inch - design something that's about 1/2 inch or so and I'm in! @James Dvorak: James, Hug-A-Plug takes about as much space as the plug connection plug and has the minimum dimensions required to meet UL listing standards for the US and Canada. Without a ground terminal, the plug could be about 1/16" thinner but you would lose the flexibility of connecting ungrounded and grounded cords. I am sorry to say but I totally agree with Mr. Dietz, I have used these side plugs for quite a while. In fact I have ones with three sides if I still want one cord to attach to the front because there isn't enough room for certain plugs to fit next to the wall. I must admit they look great but they are not new. Regards. HAL-LE-LU-JAH! This will save me countless frustrations... So glad someone produced this product because I have been complaining about awkward plug-ins for most of my life! P.S. I wonder if this product is something the women will appreciate more than the men. Yes, there are similar products out there. I own a million plug adapters so that I can plug things in overseas or plug more things into one outlet. But I've never seen an adapter like this that changes the plug's orientation and does so in a very slim way. The ability to push furniture (or my beloved and numerous bookcases) up against the Hug-a-Plug is a lifesaver when you're trying to arrange furniture and make things look tidy. BRILLIANT!!! Talk about making zillions of people's lives easier. Thanks, Bob & Daily Grommet. But, sorry to hear about your not so relaxing "retirement" Bob. I had never heard of such a thing, but after your comments I did an extensive on-line search and this is the only grounded, right angle plug adapter that I could find. If this is what already existed, Bob has come up with a great improvement. Besides being twice the price, this is not designed for use inside a home unless you decorate in industrial orange chic! Thanks Bob for realizing that this just wasn't going to cut it for your and our needs! Leviton also makes a less industrial style right angle grounded adaptor they call the cube converter. Bob's design is a more elegant solution both in style and size. I'm just off the phone with Bob Green because I wanted to be sure that we didn't overstate the inventive or unique features of Hug-A-Plug. Bob said that everyone looks at his plug and says,"I've seen that before". Bob told us that "Hug-A-Plug is unlike any other UL approved dual outlet adapter plug. The plug requires only 1" of space to connect a grounded or ungrounded cord which was achieved though a fairly complex internal terminal design for which he was granted a utility patent." The team here at Daily Grommet believes that Hug-A-Plug solves a problem. We like our furniture and appliances flush against the wall. @joanne domeniconi: Joanne, the utility patent was granted for the plug dimensions and the internal terminal design that supports the plug size. The design patents were granted for the appearance and compact profile of the plug. These patents would not have been issued if the plug was not unique. That is not to say there aren't other adapter plugs on the market. I love the idea! I have lamps on my dining room buffet and living room cabinet. I hate that my furniture sticks out to allow for the plugs. This hug-a-plug idea will allow me to move my furniture closer to the wall. I've searched for something like this at hardware stores and nothing like it. Chiming in here….one of the things I most appreciate about our Grommet community is that we share a nose for true invention and collectively recognize good ideas earlier than the “average bear.” So I am not surprised that there are folks like @Todd Dietz and @ComedyTragedy who know the marketplace for inventions. And they are joined by people like @Julia who appreciate the advances and nuances of Bob Green’s Hug-a-Plug. There is plenty of room for all perspectives in this Grommet quest. And there is especially room for a good fellow Detroiter like Bob who wants to create domestic manufacturing enterprises. THAT matters more than the width of this plug, any day, at least to me. I recently used a product (and for the life of me, can't remember what it was) and the plug at the end of the wire was right angled. I was overjoyed. But that design is so rare - I love Bob's product. for all of the rest of my items, especially the cord for my MacBookPro. That sticks out 3", now those 3" are to the side, instead. Thanks and love the product Bob! @Christine Bastian: Christine, I can mix the colors. Please order the black and I will substitute 3 white plugs before shipment. @Christine Bastian: Use the Gift Message area to clarify the color choice you would like. Thanks Bob for being so flexible! This is a great idea. I used several hug a plugs in my kitchen behind the coffee pot, microwave and toaster. Now everything sits back against the wall and I have extra counter space and it looks neat and clean. Hi Bob, I live in an old house and only have 2-prong outlets... does hug-a-plug come in a 2-prong version? Thanks! @Kristen: Kristen, should be available this spring. Please check after the first of the year for an update on the status. I needed a plug to put behind my new TV that we hung on the wall. It fits perfectly. I already ordered two more for my kitchen counter. Thanks for coming up with this great idea. These plugs are amazing. With this product, my kitchen counter appliances are now nearly flush with the wall. It is as though my kitchen counters just got 2 inches deeper. That extra space is a huge plus. At first blush, this plug didn't look so special. But it really is. It is amazing how little space it takes and -- more importantly -- it's amazing how the plugs and cords are now out of the way because they are at 90 degree angles to the wall. This is really a great find. Congratulations Grommet on finding it and congratulations Bob on inventing it. 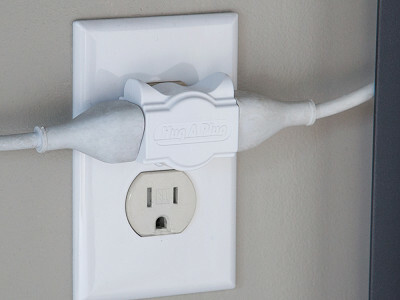 @DJP: Thanks for stopping back to share how you use your Hug-A-Plug! In our house it is the outlets that are tucked behind furniture that are now accessible that has made me appreciate the Hug-A-Plug design! Do you have this for 220, i travel to Asia each year & always need too buy power strip plugs there too operate my 110 eletronics, these look small & easy too carry. @Daniel Lynch: he only has these available with the standard US power plug. Will two of these if the outlets you have are close together verticllay (on one plate) make 4 outlets out of two if you have two vertical 3-pronged outlets? On one screw-in plate? Or is it too large vertically? @DebL: Yes! Two Hug-A-Plugs will fit on a standard plate making four outlets out of two. These things are great when trying to add additional outlets. They are much less intrusive than using other products and they fit nicely behind furniture. @Marcia Enyart: Thank you for stopping by to share how well the plugs are working for you practically & aesthetically. I would like to order a six pack of Hag A Plugs. How do I receive free shipping? I only see "visit partner sight" on your sight and don't see a code for free shipping. thanks. @ aunt b: Thank you for your interest. We're very sorry; the "free shipping" offer should have being removed from our site; it is no longer available. It’s hard to believe no one thought of this until now: an adapter that changes the orientation of an electrical outlet, so power cords run parallel to the wall instead of sticking straight out. This way you need less clearance behind furniture and appliances. Plus, it’s a safer alternative to bent plugs and crimped cords that get jammed into tight spaces. Inventor Bob Green figured somebody, somewhere must have come up with a device to solve the problem of cramped plugs and hard-to-reach outlets. His patent attorney thought so, too. But after searching high and low for an existing solution, Bob found none. So he designed and patented his own creation, called Hug-A-Plug.